Artistry and durability meet common sense with the addition of sleek and alluring Quartz Countertops. Nothing surpasses the unique appearance and beauty of Natural Stone. 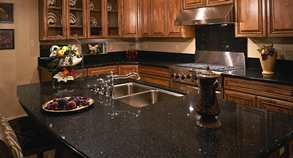 Granite is a stunning product of the earth. Cultured (synthetic) Products are a fantastic way to implement a modern look for your project and still remain cost affordable. Smooth seamless surface embraces a wide collection of color palette options so finding a look and finish to compliment your design is made simple. Marble really shows off its timeless elegance on almost every surface in the bathroom, including vanities, shower walls, and tub decks. California Crafted Marble’s experience covers everything from Residential to Commercial (New and Remodel sectors), Military, Tenant Improvements, Hospitality, Retail and Restaurants. COME VISIT OUR SHOWROOM! Offering a Full-Scale selection of quality brand products in Natural Stone (granite, marble, quartzite, and more); Quartz; Solid Surface; and our own “Made in the USA” Cultured (synthetic) Marble, Granite, and Onyx for your project needs! 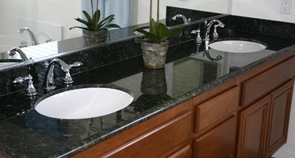 We also offer recycled glass and other materials. 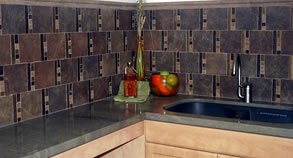 Manufacturer, Fabricator, and Installer – our specialty goes beyond Kitchens and Baths (New and Remodel). Our products are also used for Fireplaces, Laundry Rooms, Wet Bars, Outdoor Barbeque and Kitchen Areas, Shelving, Tabletops/Desktops, Public Restrooms, Reception Areas, Work Areas – and it doesn’t stop there! Serving Homeowners, Design Centers, Designers, Dealers, New Home Developers, Commercial Firms, Military, Building Contractors, and General Contractors in the Counties of San Diego, Riverside, San Bernardino, Orange, and Imperial. Explore why they follow the road to California Crafted Marble! Our specialty goes beyond Kitchens and Baths. Our products are also used for Fireplaces, Laundry Rooms, Wet Bars, Outdoor Barbeque areas, Shelving, Tabletops/Desktops, Public Restrooms, Reception Areas, Work Areas, Conference Rooms – and it doesn’t stop there!